The more questions that new people have, the better their chances are to be prepared in a new and uncertain environment. Mother nature is certainly beautiful. She is also unforgiving. Add to that the fact that when inexperienced hikers and campers head out, they don’t yet know their own physical limitations. We are going to leave out climbers and their packs in this discussion because you better have a guide for your first year (or 5) to help based on the particular climbing challenges. Packing an ax in your backpack? We are going focus on two very general backpacks and are going to simply explain here; a day trip and overnight trips that will require you pack a tent in a backpack. Day trips might be a few hours or sun-up to sun-down. Camping trips might include connecting between cottages, but it’s always wise to carry basic shelter (usually a tent) when you will be on foot in nature for days at a time. 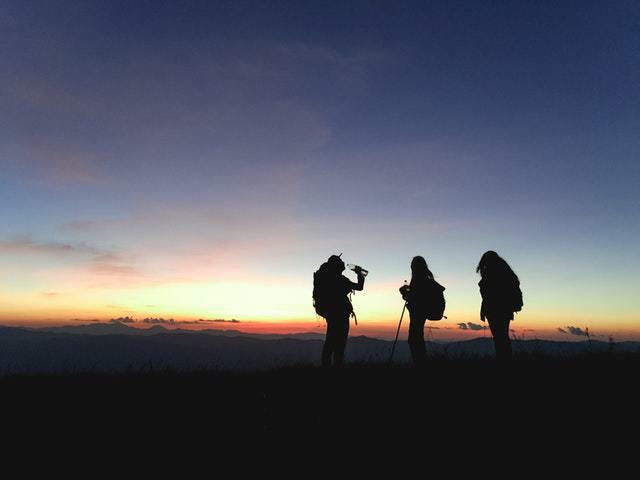 First and foremost, it’s important that people new to hiking understand that things can go wrong fast no matter how long or short you planned journey. People get lost, weather changes, and we all can slip and fall in our kitchen, let alone on an unfamiliar trail. It really doesn’t matter if you are in the wilds, a national park, or on a well-traveled trail in a small local forest preserve. Things happen. Double up on what you think you may need. Triple up if the weather is above 80 degrees. The rule of thumb is 0.5 liters an hour in comfortable weather (that’s a normal sized water bottle). You may not usually need that, but a good hike should exert you a bit. Water is heavy, but often the key to getting through any unexpected situation; rinse a wound, help someone in trouble, or just stay hydrated. It’s heavy, but it’s worth it. A lightweight first aid kit from Amazon is going to have what you are likely to need; band-aids, gauze, anti-bacterial, an eye patch, etc. People run into trees, scrape a knee, etc. These will handle most of it. Experienced hikers know that a couple of Ace bandages and a few of those “break to activate” ice packs can also make a huge difference. There isn’t much weight, space, or cash required. Those two additions can cover a rolled ankle, other joint sprains, strained muscles, and swelling of all kinds. Even if it is an hour hike, you never know. Granola bars are an old school staple. Power and protein bars seem to be the most popular these days. If it’s a short hike, throwing in an apple, a pear, or an orange also makes some sense. No need to go crazy. Most people can do a few days without eating, but staying fed can be a bit helpful when a blown ankle turns it into a day. You can certainly buy one of those mylar metal blankets. They weigh ounces and cost a few bucks. In fact, most first-aid kits include one. Experienced hiker know that a light and durable twin blanket can be even more useful. You can throw it over a tree branch for shade, keep warm in the cold, or help carry someone out of trouble like a stretcher. It takes up a tiny part of even the smallest backpacks, weighs little, and is worth the space. If you are into digital toys, a nice GPS can be very useful (the Gamin GPSMAP 64st, TOPO U.S. 100K is a hi-res GPS that is great for hiking). However, for a day hike, they are rarely necessary. If you are not a digital warrior, or just want to escape that world, you should have a map and a compass. Mark the map at your starting point before you head out. Printing out a Google map is fine, and so is the brochure that the park you may be exploring provides. The most important thing is to get your bearings before you head out. These are the basics for a day trip. They are also the starting point for a more extensive trip that involves living for nights without a car or a hotel. They are necessary for any time you head into nature, no matter how well traveled your trail. Where you put things in your backpack can make a huge difference to your efforts when you are carrying around food, shelter, cooking pots, medical supplies, and whatever else you may need for the trip. Most big packs have easily accessible side, back, and top pockets. In those, you need to keep the basics; water, food, first aid, and navigation. It’s really four of the five “day pack” requirements described above. Adding a nice knife is the last one. They are small, light, and you never know when one will come in handy. You will use them the most often, and if you can reach them with the backpack on, you will save a great deal of energy taking it on and off. This is the one too often missed by newbies to long hikes and camping in wilderness areas. Your back pack needs to stay balanced for several reasons; it keeps you safe on difficult terrain, it gets the most in the pack possible, and it makes the on and off a heck of lot safer and easier. Until you have hiked a few hundred miles over many days with all you need on your back, this may not make a great deal of sense. This one is really a matter of choosing the right materials and budget. For example, you can purchase a zero degree mummy sleeping bag that will keep you warm in the worst cold and take up a tiny bit of space; but it can set you back a few hundreds dollars depending on what you buy. You can also buy a fleece king size blanket for ~$25 that will work well down to 40 degrees when camping outside in the winter in all but the artic. The point is how big is it, and how much space will it take up in your pack. There is an art to packing a backpack. The best advice is to think of it as stacking logs horizontally, not sticking things in the backpack vertically. It makes the best use of space, balances the load on your back, and the more you can carry, the better prepared you are to handle whatever comes your way. Let us start with a basic list of required items, and then lay out how to pack it in a way that is safe and efficient. How to pack a tent in a backpack is really easy if you have an eternal framed unit. They all have compression straps at the bottom that you can use to tie in the tent in a way that rides just under the buttocks. Tents are usually the heaviest item you carry into the woods and keeping it around your hips and center of gravity will make a huge difference when carrying it for hours or days.If you have a small pack without them, a few bungee cords to suspend the tent from the backpack works just as well. You can buy tiny tents that weigh a few pounds that can go into the pack, but like sleeping bags, it is all about your budget. A good lightweight two person tent from Amazon works for most people, and packing the tent low in the pack will make the best use of space and provide the best comfort. Don’t forget the A, B, C’s described above. There is a reason that granola bars and dehydrated foods have been the preferred nutrition for people who have had to carry their nourishment into the wild for over 100 years; they are light, maintain nutrition, and with a little finesse, taste just fine (though salt and pepper can help a lot and don’t take up much weight or space). Canned foods also work obviously, but the trade off is always weight versus calories. A can of Campbell’s or Chunky soup (or even better … stew) is a great option for a short 2-3 day trip. On longer trips, keeping a can or two for emergencies is great, but it is worth it to find much lighter and portable food supplies for longer trips. Day trips and hikes are one thing. Heading out with a tent and planning on camping are another. Diabetics know that they need to carry insulin. Like water, carry twice as much as you think you need. Insulin also needs to stay cold, and there is rarely ice in the wild. Just in case, bring a few vacuum insulated thermoses stocked. Most diabetics remember that. What people too often miss are the less obvious. If you take blood pressure meds, bring twice what you need. Bring Advil and Tylenol. Advil keeps swelling and inflammation down, and Tylenol is a great pain reliever in a pinch. Think of it this way, legal prescriptions and over the counter pills take up almost no space. Break an ankle, and a one day hike turns into three. You will want your prescriptions and some basic meds to make the walk out tolerable. There are no charging ports in the wild. Even if you want to keep your phone off and don’t want to carry a GPS, you want it available if needed. Pack the devices at the bottom of the bag, and hope you never need them. Include a few huge batteries for the worse case scenarios. That’s the point of preparation. Even if you can’t check your e-mail or text, if you can turn on your phone, rescuers can find the signal. This is the most important thing for anyone trying to get through an ordeal in the wilds …. bring matches. Preferably waterproof matches. A pack is not expensive, store them in several compartments of the backpack, and keep a few on you. The romance on TV and movies about making fire is silly. Give it a shot before you head out to camp. It isn’t easy making your own. Fire gives warmth, purifies water, keeps predators away, can signal for rescue, cauterize wounds, and do a heck of a lot more. See some fun things to bring camping here or nececary things to take camping here. Now that we have a list of the items needed to stock a backpack for a long camping trip, we will wrap up with how to pack them. One, keep the heavy stuff low. 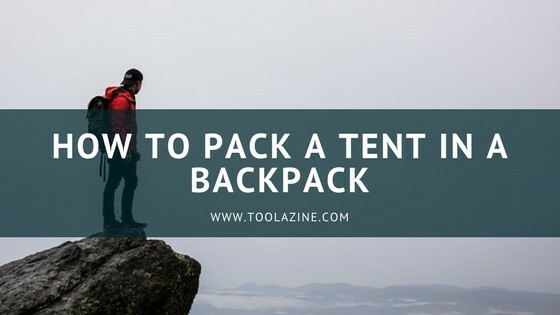 The tent is usually the heaviest, so keep it hanging from the bottom of the pack or low on the inside if you have a small one. Then add the cookware and any canned foods. Keep heavy stuff close to your back rather than on the outside of the pack as this will help the balance of weight and make the pack easier to carry. Keep some water handy in the side compartments, pack the rest on top of the heavy stuff. Next goes your clothes. Bring a bunch. You have to carry them, but no one cares about wrinkles while camping out with a backpack. Roll them up tight. Last, throw your blankets and first aid up top. They are soft and won’t hurt as much bumping against your head all day. Keeping the first aid kit at the top means that itis ready for any emergency. Hi there! I found even more very useful tips here that I expected. One of the first I always talk about is caring a heavy stuff in the bottom of a backpack. I learned this a hard way- being on a weekend-long backpacking with a tent on a top of a backpack. My back was hurting so much I have to stop every now and then to get a backpack of and rest. Not a fun thing to do.